Follow the steps below to start using the latest version of StockMarketEye. You'll be using the great new features in no time! Note: Be sure to quit StockMarketEye before installing and running the new version! If you have purchased a previous version of StockMarketEye, you can try out StockMarketEye 4 free, for 10 days, and purchase the upgrade for only $40. If you have not yet purchased StockMarketEye, your trial period will be extended within StockMarketEye 4 to a full 30 days. You can purchase a new license for $99.95. 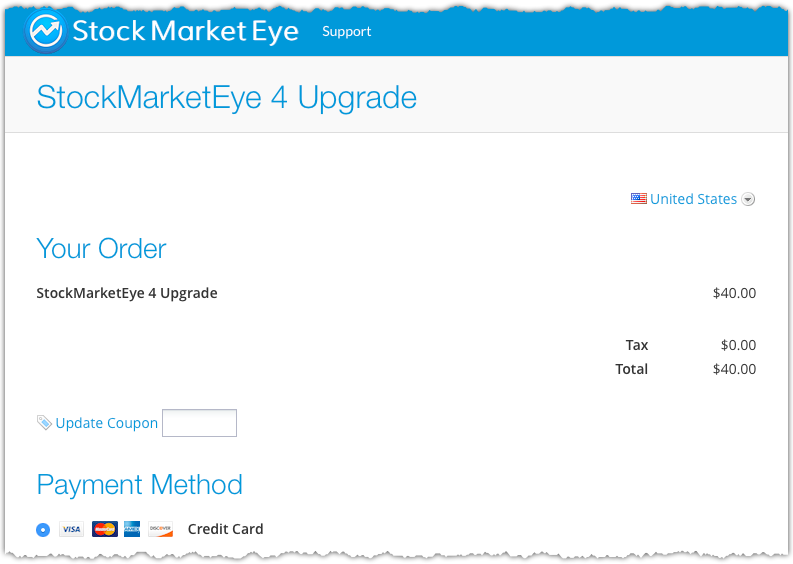 From within StockMarketEye 4, use the menu, Help -> Purchase upgrade for StockMarketEye 4. Note for trial users: the menu will be to purchase a new license, rather than upgrade. The purchase page will open in your web browser. Follow the instructions there to fill in your details and complete the purchase. After the purchase has been completed, you will receive an email confirmation. 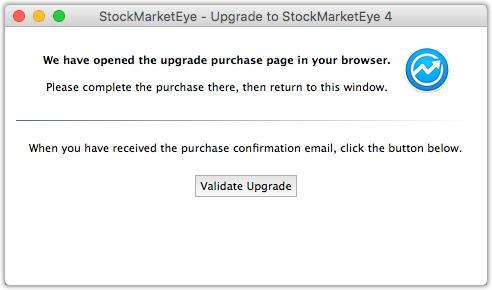 When you have received the confirmation email, click on the "Verify Upgrade" button in the StockMarketEye window. After successfull validation, you're ready to go. Thank you for upgrading! You can continue to use the previous version if you do not wish to upgrade. If you have already installed the upgrade, but would like to go back to the previous version, please see the section below. Your existing StockMarketEye data is stored separately from the application itself, so you can safely uninstall the old version before hand. It is possible to install over the old version (i.e. without uninstalling first), but we recommend you first uninstall the old version, then install the new one. If you have already installed and tried the upgraded version of StockMarketEye, but do not wish to use it at this time, you can go back to using the previous version, without paying for the upgrade. In the future, if you decide to upgrade, simply download and install the lastest version from our website. The upgrade fee will be applicable at that time.